If you have any questions or suggestions you are welcome to join our forum discussion about Relative Momentum Index. Developed by Roger Altman and originally described in the February 1993 issue of Technical Analysis of Stocks & Commodities magazine, the Relative Momentum Index (RMI) is basically a variation of the Relative Strength Index (RSI). The RMI counts up and down days from today’s close relative to the close ”n-days” ago (n is not limited to 1, as required by the RSI). The RSI, on the other hand, counts days up and down from close to close. If we have the RMI parameterized as follows – closing price, RMI period of 14, momentum period of 1, it will be equal to an RSI with a period of 14 and closing price. It is so, because the momentum parameter is estimating only a one-day change in prices. Increasing the momentum periods will result in smoother RMI fluctuations. 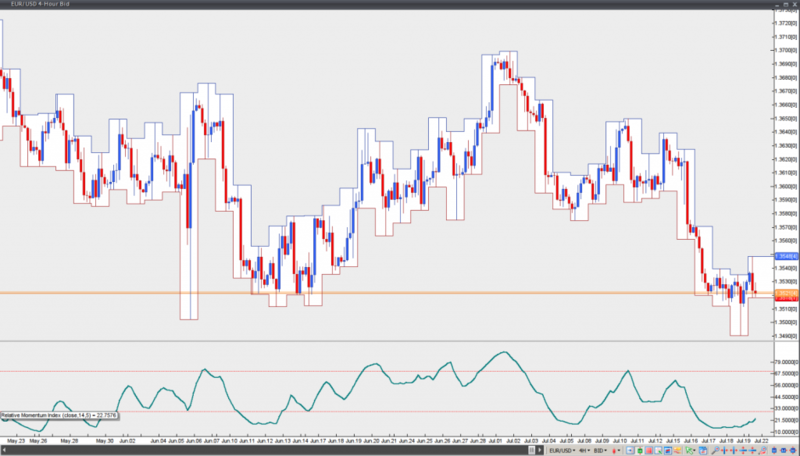 The RMI is an oscillator and as such it has the same advantages and disadvantages as other technical methods, reflecting overbought and oversold conditions. In trending environment the RMI will usually remain at or in proximity to overbought or oversold levels for quite a while. In trading ranges, however, the RMI has a tendency to be more predictable, oscillating between an oversold level (10-30) and an overbought level (70-90).